Does Israel Have a Problem With American Jews? Benjamin Netanyahu's government unveils an ad campaign urging expats to come home, and some Jews in the U.S. find the message insulting. Excerpt: " The Netanyahu government is insulting Americans: "I don't think I have ever seen a demonstration of Israeli contempt for American Jews as obvious as these ads," says Jeffrey Goldberg at The Atlantic. "The message is: Dear American Jews, thank you for lobbying for American defense aid ... but, please, stay away from our sons and daughters." Apparently, Netanyahu's government thinks that "America is no place for a proper Jew." That's appalling." more at link..
"Netanyahu government suggests Israelis avoid marrying American Jews"
Thanks for this article Barbara. The issues surrounding Jews inAmerica vs. those in Israel are complex indeed. The divide need not be exploited. Israel society, like those of many other countries in the Middle East is ruled by social policies that are dictated by religious zealots. There is more diversity within the religion here in America both by nature and in practice. There are many who can't stomach this, hence the divide. Give me your money, just don't come near our children? 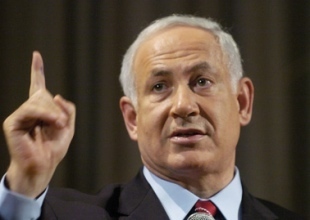 This guy is costing Israel, not just in reputation, but in over all perception of the country. Cal is correct, these are zealots not just religious people. You're really scraping the bottom of the barrel. I read this article a YEAR AGO. But an anti-semite such as yourself doesn't mind being desperate enough to go way, way back to try find something bad to say. Beth get a life! This is still news. Hello! You and your name calling bully's, on the other hand, ARE old news! Anti-Semite does not fit who I am..! Not even close..